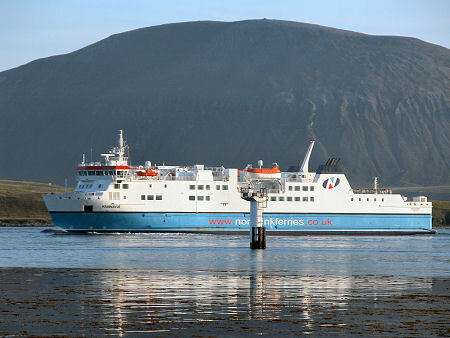 In 2002 Orkney's main ferry link to the mainland, the service from Stromness to Scrabster near Thurso, was taken over by NorthLink Ferries. For current timetable and fare information, and for bookings, visit NorthLink's website. 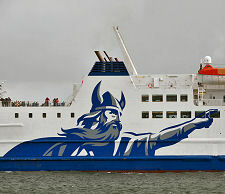 The ship introduced onto the service was the MV Hamnavoe. 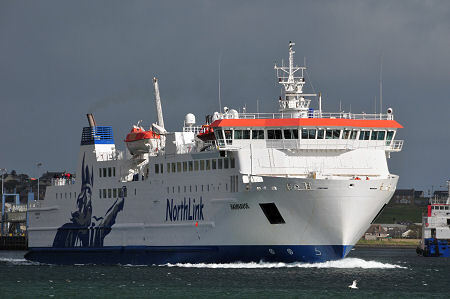 At 110m long this was by some margin the largest vessel ever used on the service and the quality (and quantity) of the accommodation on board reflected NorthLink's intention to provide a "cruise ship" feel. 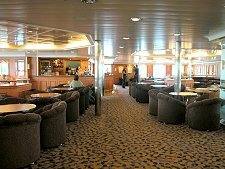 The crossing may only take 1½ hours: but this is just long enough to begin to feel at home in the ship's extremely comfortable surroundings. 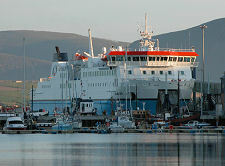 The size of the MV Hamnavoe is readily appreciated if you see it berthed at Stromness, where it seems to tower over the harbourside buildings. The images on this page give a sense of the scale of the change in their comparable views of the Hamnavoe and her immediate predecessor, the St Ola, which was operated by P&O ferries. But if the Hamnavoe seems large from the outside it seems still more so internally. From the capacious car deck all the way to the sun deck from which the crossing of the Pentland Firth can be appreciated, this really is a big ship. 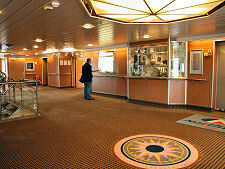 Immediately in front of the sun deck is a large bar area, while further forward on the same deck is the restaurant. 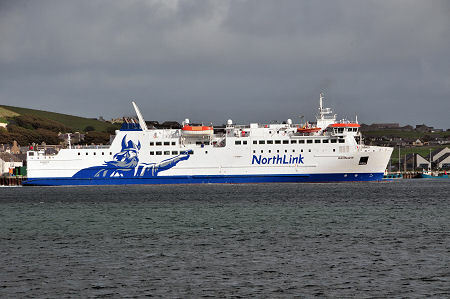 NorthLink Ferries take the quality of their catering seriously: and whether you are embarking on a visit to Orkney or facing up to a long drive south from Scrabster, you could do far worse than sample the excellent food on offer. A second deck of passenger accommodation lies beneath the first, including lounges and a creche, and 20 passenger cabins. 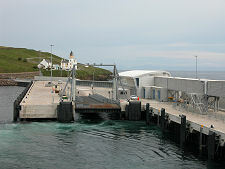 Your trip north from Scrabster on the Hamnavoe starts at the pier built out from the low cliffs near the Holborn Head lighthouse. 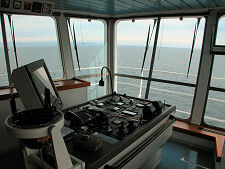 Having cleared Holborn Head you then sail directly north, passing Dunnet Head on your right before encountering the open Pentland Firth, a stretch of water whose fierce reputation comes from the meeting of North Sea and Atlantic tides here. 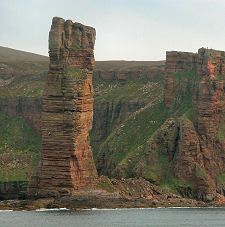 Landfall is near Rora Head on Hoy. 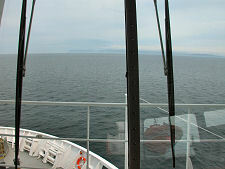 Your cruise then takes you round the west end of Hoy, giving spectacular views of the Old Man of Hoy en route. 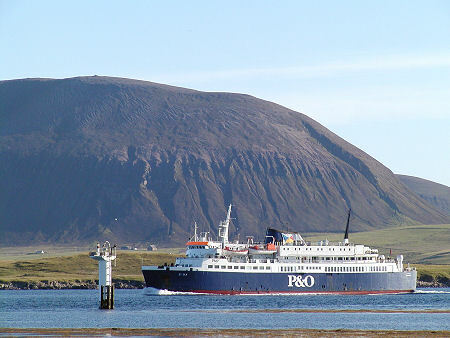 After passing through Hoy Sound with Graemsay on your right you round the corner into the inlet of Hamnavoe: and Stromness suddenly comes into view. 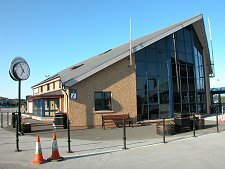 Welcome to Orkney! 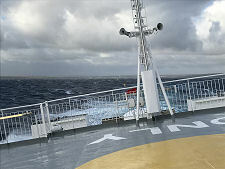 An alternative route sometimes used on stormy days is to head round the eastern end of Hoy, before crossing the sheltered waters of Scapa Flow to Stromness. Full details, including current timetables and prices can be found on NorthLink's website.